Spring is coming (supposedly) and that means it's tour season. One (of many) reason(s) why midwesterners are badasses is because we have to endure driving through some of the most boring terrain on the planet just to get out of here. If you're headed to the east coast, you'll most likely roll through the not-that-exciting landscape of Ohio, but the state does in fact have some cool things to do. 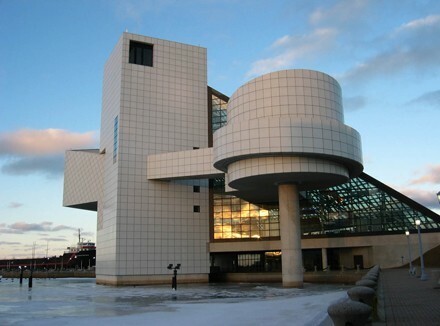 If you're a band on tour, you can get into Cleveland's Rock and Roll Hall of Fame and Museum for free. You have to prove you're a touring band, though. You can enter by flashing a tour laminate, but if you don't have that, they'll settle for a piece of merch. And if you don't have merch, just be annoying. Reader associate editor Kevin Warwick claims that his band got in by disarming the gatekeepers with a silver tongue. "We pretty much just wore them down," he says. While you're there, check out this permanent exhibit that includes fellow midwestern musicians Bob Seger, Prince, and the Coug.